Have you ever needed to send an email to a group of people, but wanted each recipient to feel like they received a personalized email? We have as well and that’s why we created the Group Message in Nimble. You can send up to 100 group messages (upgrades available!) per user per day and since the messages are being sent via your email provider, nobody will know who else is on your list or even better, that they are even a part of a group outreach. Our goal is to make it easier for you to send personalized messages at scale. This feature is not meant to blast your entire email list, but rather to message targeted groups of individuals. 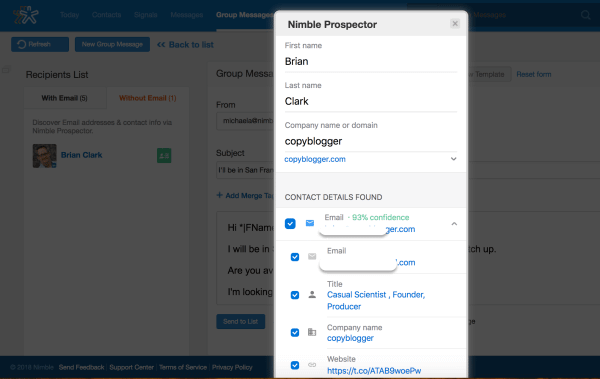 Once you create a group of people you want to reach, cycle through the contacts with our Nimble Prospector feature to find their missing email addresses for your outreach. Next, write your message to send to these people and hit send. 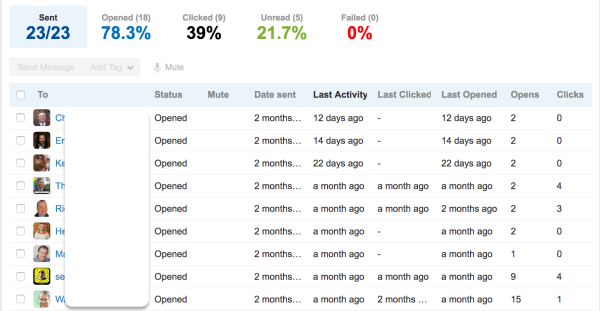 After sending, wait for the open and click tracking stats to flow into Nimble so you can follow-up with those that were engaged or those who opened but haven’t send a response yet. If you are a Gmail user, add our Nimble Smart Contacts app, which allows you to track and load templated emails for messages sent over the Gmail web client. Enable email tracking to get open and click notifications in Nimble and on your desktop when someone interacts with your message! 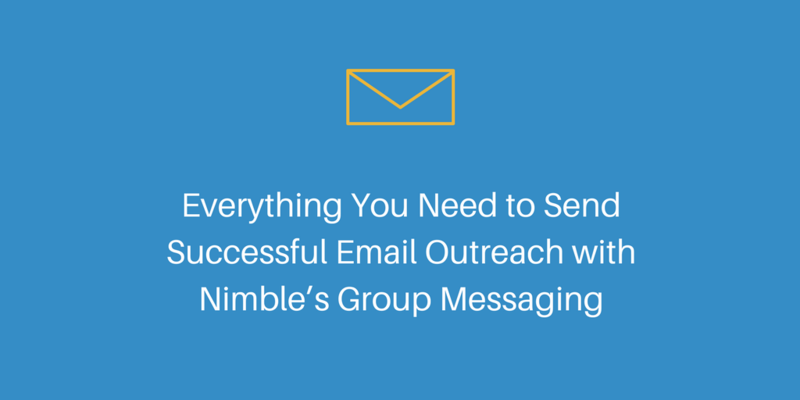 Before you can write your message and hit send, you’ll have to create a group to target in Nimble. In this example, I’m using our smart search and segmentation to surface all the people in my database that have the title CEO and were contacted by me via email or Twitter within the past 90 days. After you’ve created your target segment, select “Send Group Message” from the contact list view to load your recipients and start composing your message. Use merge tags while composing your message to insert variables for First Name, Last Name, Company, or Job Title to personalize your message. Add files, images, or hyperlinks to add rich content to your message. Once you compose your message, you can also save it as a template for future use. If you’ve already created templates, you can select one and customize it to fit your current needs. Here’s how I used hyperlinked text for my message. We use Calendly to schedule meetings and avoid back-and-forth emails, which has proven to be very effective for booking times while juggling everyone’s calendars. As you can see under my “Recipients List”, there’s one person on my list that’s missing an email address on their Nimble record. Thankfully, I have Nimble Prospector and I’m going to show you how I used it to find the missing email for my recipient. Once an email is discovered, Nimble will share a % confidence level that it has found the correct email for your recipient. After saving this information, you are all set to send your outreach. Before you do so, we recommend sending yourself a test message to ensure that there are no typos, all attachments are attached, and your included links work. Your bulk outreach will be received as a sincere one-to-one conversation rather than a mass email blast. Since your message will look to the recipient as it was sent only to them, the open rates tend to be much higher than if sent from a marketing automation system. Using templates and not having to retype messages saves a lot of time. You can easily see how your message performed, use the findings to tweak the message next time and easily follow-up with those that engaged with your message but have not responded yet.